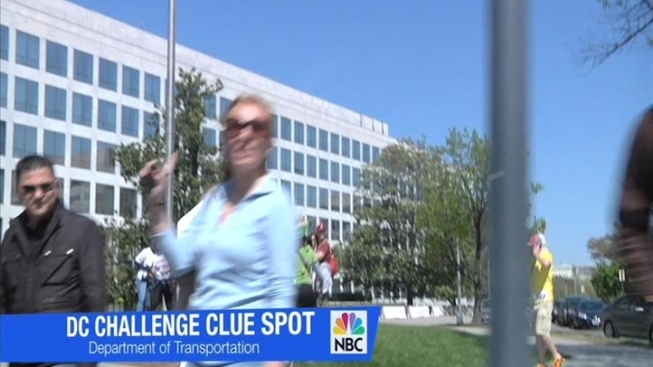 America's Biggest Scavenger Hunt kicks off without a hitch. A little rain never stood a chance at stopping the D.C. Challenge. The event, which was postponed from Saturday, April 16 to the very next day due to rain, kicked off with no noticeable hitch as more than 1,200 adventurers ran, dodged cars and stumbled their way across the District. The event, which is currently America’s biggest recorded scavenger hunt event, gave registered teams a checklist of 12 clues they must solve before returning to the starting point at The Yards Park. At the 1:30 kickoff, several teams rushed to the Navy Yard Metro, while others opted to plan their route and begin solving clues back at The Yards Park. There was no limit on team members, but the larger the crowd, the harder the transit. Finishing the race involved reaching 11 out of the 12 clue locations and taking a photo of the team at each spot. Winning teams would snagged $750, $250 and $150 for first, second and third place respectively. Adding to the chaos was an ancillary “best team costume” prize of $500. Confused D.C. residents stared on as a squadron of Where’s Waldos, Super Mario Brothers, Double Dare-ers, "Clue" characters and D.C. memorial replicas ran from clue to clue, ordering nearby pedestrians to take their pictures. The first teams crossed the finish line shortly before 3:30 p.m., clocking in their total time at just short of two hours. Each placing team consisted of just two members. Once most teams finished, they were treated to a live concert and drinks at the Yards Park. And by the looks of most participants' overheated faces, we’d say they needed it. Check Out the Scene: Keep up with what's happening in the D.C. area anytime, anywhere. Follow us on Twitter and Facebook. Sign up for our e-mail newsletters, download our iPhone app or join our Flickr group.